Rain and strong winds made fishing difficult on the weekend but the water levels of all the lakes are really starting to rise. Check out Tantangara, 28% this week! Flyfishing in Lake Eucumbene is improving rapidly with the best fish this week a 2.75kg brown. Tantangara should fire too. Bait and troll has been excellent in the lakes also. So get out your gear and come fishing up here! Lake Jindabyne:- Jindabyne reports have suggested tough fishing and polaroiding. There were good conditions during the week but they were hopeless on the weekend. Despite this there has been a few better reports on the polaroiding front. Jindabyne is set to fire as the rising lake level continues to cover new ground and warms with the onset of Spring. There will be some fantastice shorebased fishing in coming weeks. Lake Tantangara :- With the level of Tantagara at a Snowy Hydro reported 28% the fishing up there will be fantastic. Access may still be an issue with all the rain of the weekend, but certainly if you can get in, there should be some great fishing over flooded ground. Though the water temp is likely to be cold there should be enough food items getting forced out of the ground to tempt a few fish in close. It has been five years since the lake has been this high! Overal the lake has been fishing very well on the troll with a mixture of flatline and leadcore working very well. *Ken Sykes caught this 725gm rainbow and a 1.7kg brown trout trolling with Tassie devil #67 recently. Ken was fishing in the Buckenderra arm. Best lures this week were Viking minnows, tassie's in frog, yellows aand pink and a virtually any minnow in rainbow trout colours. Boat launching is still very good at the Old Adaminaby ramp and Jacqui from Buckenderra reports that they have moved their ramp to a new spot and it is working well. 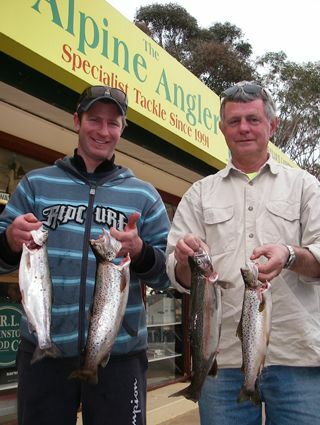 *Matthew Collins and Rodney Woodward fished East Jindabyne late last week and managed these nice fish. The fish were taken on a #7 Thunderbolt on three colours of leadcore. Bait fishing has been excellent with some nice reports of rainbows and being taken on powerbait and grubs. *Kirsten Greenway caught this 2 kg (gutted) brown trout on a grub and powerbait cocktail out of Buckenderra recently. A very nice fish.